Most fatal fires occur at night when people are sleeping. A working smoke alarm will detect smoke and sound to alert you. Effective March 1, 2006, it is the law for all Ontario homes to have a working smoke alarm on every storey and outside all sleeping areas. This covers single family, semi-detached and town homes, whether owner-occupied or rented. There are two different types of smoke alarms to choose from. Ionization Smoke Alarm uses a small amount of radioactive material to ionize the air between two electrically charged plates, causing a measurable current to flow between plates. When smoke enters the chamber, it changes the flow of current, which is detected and activates the alarm. Photoelectric Smoke Alarm uses a light source that is aimed away from a sensor in a sensing chamber. When smoke enters the chamber it reflects the light onto the sensor, which is detected and activates the alarm. Smoke alarms can be electrically connected, battery operated, or both. Because smoke rises, it is recommended you place the alarms on the ceiling. Avoid ceilings near bathrooms, heating appliances, windows and ceiling fans. The smoke alarm should be installed between each sleeping area and the remainder of the building or where a sleeping area is served by a hallway, install the alarm in the hall. 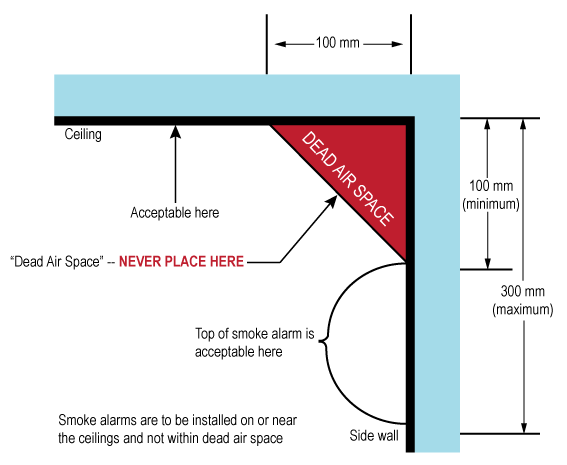 Always install the smoke alarm on or near the ceiling in accordance with the manufacturer's installation instructions. Test your smoke alarms regularly by pressing the test button or by using smoke from a smouldering incense stick. Replace batteries regularly. Install a new battery in each alarm at least once a year. All battery-operated smoke alarms are required to emit a warning sound, usually an intermittent “chirp” when the battery power is low. When warning chirp sounds, replace your battery immediately. Never wait. Change your batteries when you change your clocks in the spring and fall. Smoke alarms do wear out, so if you think your alarms are more than 10 years old, replace them with new ones. Dust can clog a smoke alarm, so gently vacuum alarms every six months using a soft brush. Never vacuum electrically connected alarms unless you shut off the power. Test your unit when finished cleaning. When installing, testing, and maintaining smoke alarms, make sure you follow the manufacturer’s instructions. Download the OAFC Working Smoke Alarms Save Lives brochure! If you have any questions regarding fire safety, please contact your local fire department.